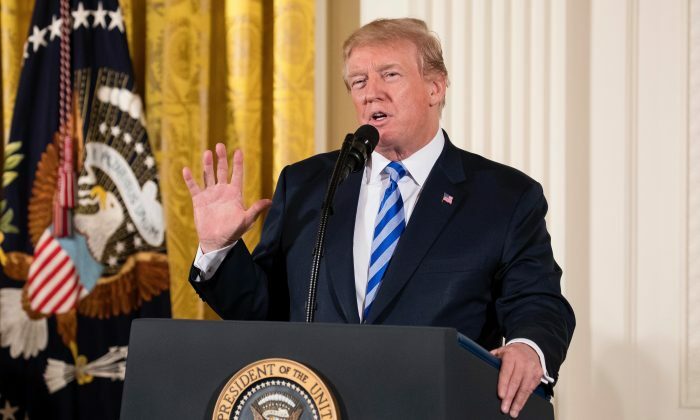 President Donald Trump on Feb. 20 signed a directive ordering Attorney General Jeff Sessions to craft regulations banning so-called bump stocks, which add a rapid fire function to semi-automatic rifles. Besides bump stocks, the directive also calls for the ban of other devices that give semi-automatic firearms an automatic function. Sales of automatic rifles are restricted in most states and a special license is required to own them. Bump stocks received nationwide attention following a mass shooting in October last year in Las Vegas in which 58 people were killed. A number of semi-automatic rifles equipped with bump-stocks were found in the hotel room of the suspected shooter. Following the Las Vegas mass shooting, the White House said it welcomed efforts by lawmakers to look into bump stocks and related devices. “We know that members of both parties and multiple organizations are planning to take a look at bump stocks and related devices. We certainly welcome that, we’d like to be part of that conversation,” White House Press Secretary Sarah Sanders said on Oct. 5, 2017. She said the administration would like to get a clear understanding of the facts as well as obtain input from victims’ families, law enforcement, and policymakers. The National Rifle Association (NRA) also expressed a willingness to support restrictions on bump stocks following the Las Vegas mass shooting. Correction: A previous version of this article incorrectly stated that automatic firearms are prohibited in the United States, instead they are subjected to additional regulations.